All blocks contain, at a minimum, the following configuration options. Block titles do not have to be added. If you wish to not display a title just enter <none>. Make sure you include the <>, otherwise your block title will be "none". A region is an area within a theme where a block is placed, such as Sidebar or Main Content. For our OSU Drupal 7 distribution, the Doug Fir option applies for audience facing content and the Adminimal option applies for all administative pages. Within the Pages visibility settings tab you can configure your block to only show on particular pages, or even a range of pages. First, select the Only the listed pages option. For the front page, just enter <front>. Make sure to include the <>. ...the base URL is the examplesite.oregonstate.edu and the URL path is about. In our OSU Drupal 7 environment, anything that comes after the .edu is a URL path. If we take the hypothetical about URL path and put it into the text box under our front page configuration, then we have configured that block to show on only the front page and the page that has the about URL path. This can be taken even further. For example, if you had several pages that were nested under the about URL path, you could quickly include them all by using a wildcard, like this about/*. A block can be configured to show up on a certain content type, or several different content types. 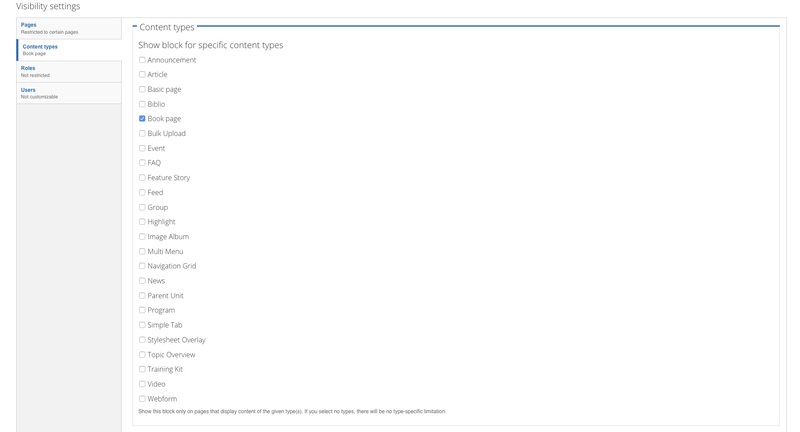 Within the Content Types visibility settings tab, just check the boxes of the content types that you want the block to show on. Doing this will show the block on those particular content types and hide the block on all other content types. Blocks can be configured to show only to specific roles. With the Roles visibility settings tab, select the roles that should see the block. Take care with this. You can actually end up hiding the block from yourself if you select the role you're using. In the Users visibility settings tab, a block can be set up so that a user has the ability to view or hide the block.